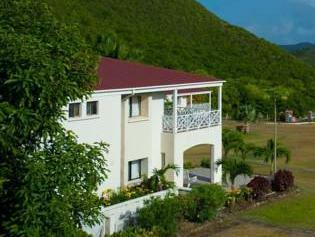 ﻿ Best Price on Mount Nevis Hotel in Rawlins + Reviews! The Mount Nevis Hotel is an elegant family-run resort spread across five two- and three- story pavilion style buildings and three two-bedroom villas. The accommodations all feature bathrooms, balconies or patios, cable TV, and complimentary Wi-Fi service. The villas and suites also have well-appointed full equipped kitchens. On property amenities include a 60-foot (20-yard) pool, wonderful garden, conference center, sun terrace, and a fitness center. The hotel’s restaurant serves dishes with internationally influenced themes. The hotel offers complimentary shuttle service to the nearby, Oualie and Nisbet Beaches. Numerous island activities can also be arranged for guests including water sports, horseback riding, hiking, tennis, golf, and deep-sea fishing. This hotel is 15 minutes’ drive from Nevis' capital, Charlestown, and just 5 minutes’ drive from the island's Vance W. Amory International Airport. The water taxi stand at Oualie beach is also within a 5 minute drive.